Research of the Max-Eder Research Group Neuro-oncology of Lower Grade Gliomas (set-up in October 2016 at NCT) focuses on the role of IDH1 mutations in gliomagenesis. IDH mutations are found in 80% of adult grade II/III gliomas and the presence of the mutation establishes DNA hypermethylation, an aberrant chromatin state and a block in differentiation. Yet, the precise molecular mechanisms by which IDH mutations contribute to gliomagenesis are not yet fully understood. 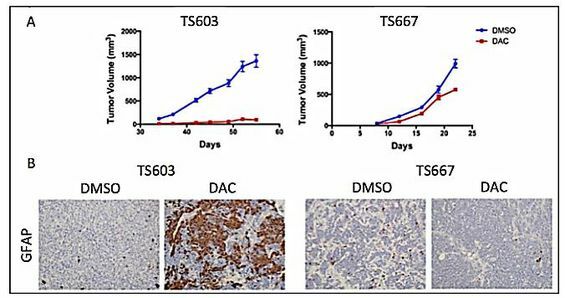 Develop a strategy to identify druggable molecular vulnerabilities in IDH1 mutant gliomas to establish therapeutic benefit. Generate in vivo models of IDH mutant lower grade gliomas to understand interaction of tumor cells with their microenvironment in the mouse brain. We hope to understand the impact of an aberrant epigenome driven by mutant IDH1 on cellular states of glioma precursor cells and define secondary mutations that cooperate with mutant IDH1. Our ultimate goal is to develop new therapeutic approaches for gliomas that may contribute significantly to the treatment of this frequently lethal cancer. Bai H, Harmancı AS, Erson-Omay EZ, Li J, Coşkun S, Simon M, Krischek B, Özduman K, Omay SB, Sorensen EA, Turcan Ş, Bakırcığlu M, Carrión-Grant G, Murray PB, Clark VE, Ercan-Sencicek AG, Knight J, Sencar L, Altınok S, Kaulen LD, Gülez B, Timmer M, Schramm J, Mishra-Gorur K, Henegariu O, Moliterno J, Louvi A, Chan TA, Tannheimer SL, Pamir MN, Vortmeyer AO, Bilguvar K, Yasuno K, Günel M. Integrated genomic characterization of IDH1-mutant glioma malignant progression. Nat Genet. 2016 Jan;48(1):59-66. We are looking for talented postdoctoral fellows with an interest in cancer epigenetics and translational cancer research. We use next-generation sequencing, molecular biology, biochemistry and mouse models to study the role of somatic alterations in chromatin reorganization and epigenetic regulation in gliomas. If interested, please send your CV, a summary of accomplishments/research interests and contact information for three references to Sevin Turcan (sevin.turcan@med.uni-heidelberg.de). If you’re a student interested in studying glioma epigenetics, please send us an E-Mail.